Five patients gave testimonials about his medical skills and described him as a kind and generous physician. Dr Murray wiped away tears after one patient insisted he was not greedy, citing the cardiology practice he opened in memory of his father in a poor community in Houston, Texas. The doctor denies all charges. Patient Ruby Mosley said she met Dr Murray when he opened his clinic in Acres Home. "If this man was greedy he never would have come to the community," she said, testifying that most residents were senior citizens on fixed incomes. Under California law, character witnesses can be offered in an effort to create reasonable doubt of guilt. The four other witnesses - who were all heart patients - said Murray was a caring and thorough doctor. "The reason I came here to help Dr Murray is I know his love, his compassion, his feeling for his patients, every one of them and I just don't think he did what he's accused of doing," said Gerry Causey from Utah. Another witness, Andrew Guest of Las Vegas, testified: "I'm alive today because of that man. That man sitting there is the best doctor I've ever seen." 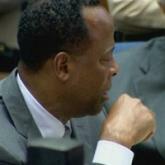 Under cross examination from a prosecutor, none of the patients said Dr Murray had treated them for sleep problems. Authorities argue Dr Murray gave Jackson a lethal dose of the anaesthetic propofol while treating him for a sleep disorder. The doctor's defence claim the singer gave himself the deadly dose. Dr Murray's final witnesses, a pair of medical experts, are due on the witness stand later on Thursday.